Our focus with a home tends to be on our lifestyle and family relating to living our lives. Yet a home is our largest financial asset and it is a large physical asset that needs to be managed. 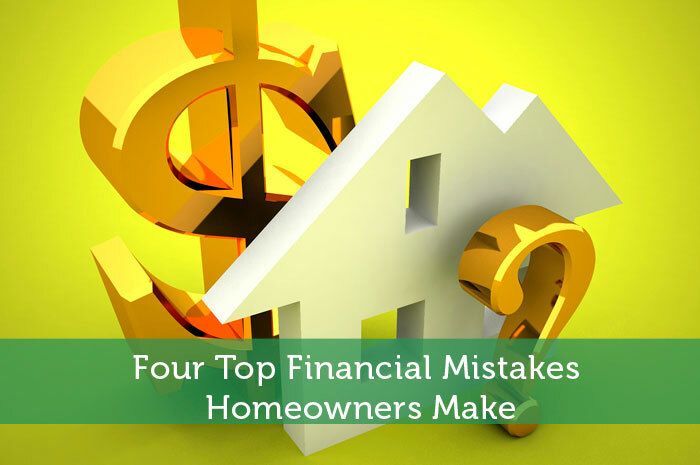 Here are four common financial mistakes most of us make and a great online solution to help you eliminate them. Not prepared for unexpected fix it or replacement costs: Your home is full of equipment, appliances, fixtures, and finishes that need regular maintenance. Forgetting or not knowing these common maintenance tasks causes your home’s assets to wear out sooner than they should resulting in larger fix it and replacement costs. In addition, forgetting regular maintenance results in higher energy costs. Your equipment such as furnaces, air conditioning units, and hot water heaters become less efficient and use more energy; while your windows, doors, and air ducts often times allow hot and cold air into the home causing your equipment to run unnecessarily. Over spending on home remodel projects: Many homeowners, especially first time homeowners, embark on various home remodel projects. The spending on these projects usually goes way over budget for two reasons. On larger projects, people don’t realize all the material items required for the project, therefore the budget is not realistic. An example is a kitchen remodel. People will budget for cabinets, appliances, flooring and countertops which are significantly large items. They will forget items like light fixtures, a garbage disposal, plumbing fixtures, exhaust hoods, and a host of other items. Another reason for going over budget is that people do not research enough product and brand alternatives for each item in their project. A remodel project can vary greatly depending on the price points of products that are in the low, moderate, or high end of the spectrum. A kitchen remodel can easily be 40 to 50% over budget because of product selections. Not being properly insured: Most homeowners do not have a home inventory that includes an itemized list to go along with photos and documents. This results in two financial risks. The first is not knowing the value and type of your contents which means that most people are under-insured. Special riders are required for many items in a home that are not covered in a standard homeowner insurance policy. The other risk is not getting properly reimbursed if a fire, flood, burglary or other natural disaster were to destroy a home and its contents. Victims of natural disasters often times report painful, not timely, and inadequate reimbursement after a major property claim without a home inventory. Lack of Data when Selling Your Home: Most homeowners are terrible at keeping records of their home including the fixed assets, maintenance history, remodel projects, and other important property documents. By keeping these records as a digital home history, a homeowner can use them in the marketing of their home to build confidence with buyers, as a well maintained home usually sells for more and quicker than competing homes. In addition, it is important to know what your tax basis is in your home. Keeping track of those home remodel projects that improved the home increases your tax basis and can therefore save you money on your taxes when you sell the home. A common aspect in avoiding these financial mistakes is tracking and managing all the digital records about your home. HomeZada is a new online solution that helps homeowners save money, improve the value and be better prepared with their home. The HomeZada solution provides unlimited photo and document storage for a digital home inventory, an automated home maintenance schedule with monthly reminders and recommendations, as well as remodel templates to manage budgets, costs, documents and photos. In addition, there are a number of financial dashboards and the ability to share a subset of this data online as a property website to help market your home when you decide to sell it. With the amount of money we invest in our homes, and the expenses we spend annually, a $59.00 annual subscription for HomeZada is such a bargain considering the ability to eliminate some of the common mistakes listed above. The solution can pay for itself really quickly both in the short and long run. Learn more about this digital home solution. I can definitely see how new home owners could get carried away with remodeling projects. That is why it is so important for you to set a good budget and know what you want. It is also a really good idea to set money aside just in case any unexpected financial needs come up. It is better to be safe than sorry. That is why it is always a good idea to get help handling finances from a professional.